Technology is the backbone of every business, but there are different ways it helps certain industries. When it comes to Real Estate, technology can help in very visual ways. Real Estate is all about the property and showing potential clients how it can transform to become the home of their dreams. In a previous blog post we talked about how an IT partner can support your technology. This week we are going to highlight some of the ways it can help in real estate. First things first. Is your website easy to use? Every real estate website has the home search. It’s pretty standard for the business. The problem with this is you are giving potential clients the chance to find a home, and then contact someone else to buy it. How do you combat this? Add a contact form. You can keep the search but ensure they can put in their information to find out more. In this day and age everyone works from anywhere. Being a real estate agent you are traveling open house to open house. Why not ensure you can always answer emails and questions no matter where you are? An IT partner can set your team up with tablets that are equipped with the right apps so they can be successful no matter where they are. The days of waiting for a contract to arrive so you can sign it in person are over. It’s all about electronic signatures now. Docusign is one of many tools out there that lets you sign documents online. Once one person signs, it sends the document along to the next person and can notify you when they have signed. This can help shorten the time frame of the buying process. An IT partner can help set your office up with the right tools to make the buying process easier for your potential clients. Being in real estate means you are handling very sensitive information about your clients. An IT partner can setup the proper data security protocols to ensure confidential information is always protected and secured. They can also ensure that the proper backup techniques are in place in case anything happens. 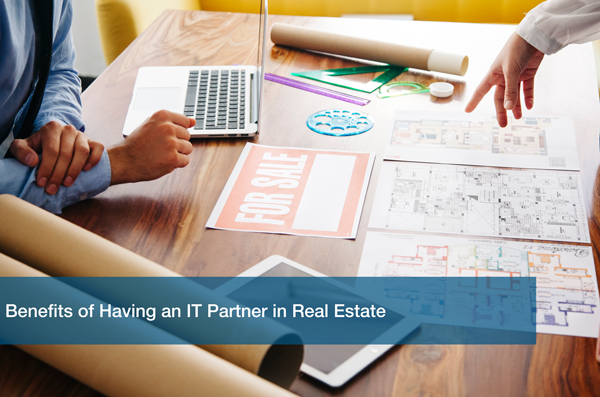 Still unsure how an IT partner can help your real estate business? Schedule a Free IT Analysis with one of our small business IT experts. They can conduct a consultation of your current systems and identify areas in need of improvement. Call or visit us to start making the necessary changes to your IT today!